Residential design is often the most personal of exercises. A balance between art and shelter. A house is after all, a kind of tailored suit for people and their lifestyles. We begin by listening and learning about our clients, and when we have a sense of who they are and how they live, we begin conceptual planning. Like a great clothing ensemble, the finished product of spaces, finishes, and details should make you look, feel, and live… better. Sustainability is at the core of what every house can be for every owner. 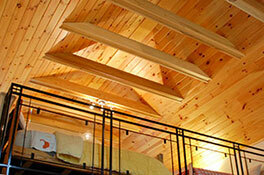 We design energy-efficient houses that are cost-effective to build and use over time.